Firstly, I am not aware of much discussion on the topic. But ClF3 is certainly well-known, and so it is trivial to suggest BrBr3, i.e. 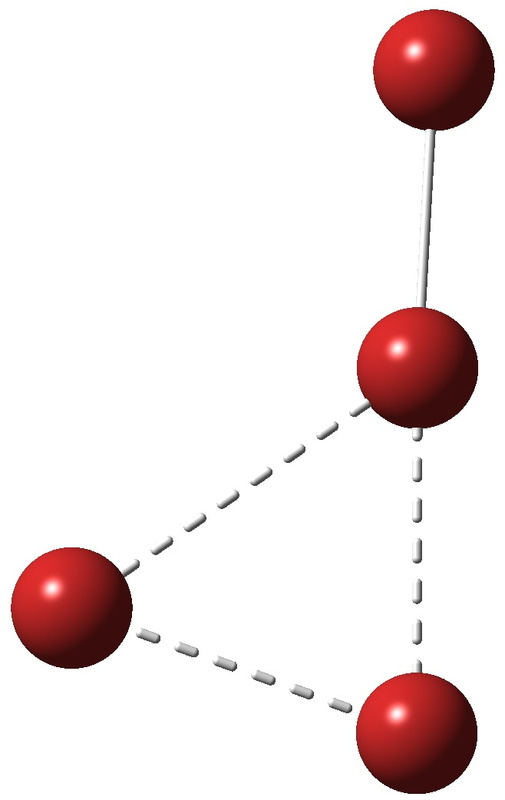 Br4 as an example of a halogen allotrope. Scifinder for example gives no literature hits on such a substance (either real or as a calculation; it is not always easy nowadays to tell which). So, is it stable? A B3LYP+D3/6-311++G(2d,2p) calculation reveals a free energy barrier of 17.2 kcal/mol preventing Br4 from dissociating to 2Br2. The reaction however is rather exoenergic, and so to stand any chance of observing Br4, one would probably have to create it at a low temperature. But say -78° would probably be low enough to give it a long lifetime; perhaps even 0°. So how to make it? This is pure speculation, but the red colour of bromine originates from (weak, symmetry forbidden) transitions, with energies calculated (for the 2Br2 complex) as 504, 492nm. Geometry optimisation of the first singlet excited state of 2Br2 produces the structure below, not that different from Br4. At least from these relatively simple calculations, it does seem as if an allotrope of bromine might be detectable spectroscopically, if not actually isolated as a pure substance. This entry was posted on Sunday, April 26th, 2015 at 6:25 pm and is filed under reaction mechanism. You can follow any responses to this entry through the RSS 2.0 feed. You can leave a response, or trackback from your own site. Actually, valence shell expansion does NOT occur in these species. For discussion of this point, see http://www.ch.imperial.ac.uk/rzepa/blog/?p=2687 There, I discuss another allotrope, this time of Iodine, I8, or I.I7, and how it is not hypervalent. Hypercoordinate yes. In fact this allotrope of iodine is not stable, since it extrudes I2 with no activation barrier. But I4 might be. Interesting suggestion but note that Br is a heavy element and to be sure of the reliability of ab initio calculations relativistic quantum chemical methods (DHF for instance) must be also employed. In such heavy elements it is quite probable that the effects of relativity may change even the qualitative picture emerging from non-relativistic calculations. Relativistic effects in Br are normally modest (for properties such as eg energies and structures, not so of course for eg magnetic shieldings), but of course this is not a state-of-the-art calculation and it would be good to know how modest they are. I think a transient species most certainly can be useful. Singlet oxygen is a transient “allotrope” of oxygen, but useful none the less as an oxidant, as also is ozone, another allotrope. Br4 is potentially a masked Br(+).Br3(-) and so, like singlet oxygen, might be a useful source of activated Br(+). NRT suggests that it is rather Br(-).Br3(+) than Br(+).Br3(-). Can you expand NRT. I presume it is not the gas law nRT. I used a Natural Resonance Theory (NRT) analysis, which is a part of the natural bond orbital (NBO) theory, to get the resonance structure weights by fitting electron density of Br4 available from the B3LYP/6-311++G(2d,2p) calculations. The Br4 structure had a D3H symmetry with the Br-Br distance of 2.5201 Å. The NRT analysis shows three dominant resonance structures Br(-).Br3(+) with identical weights 16.1*3 = 48.3%, three apparently long-bonded resonance structures (Br-Br). (Br—Br) with the weights of 8.1*3 = 24.3%, and one hypervalent structure BrBr(Br)Br, 7.9%. The natural population analysis charges and Mulliken charges predict a partial negative charge on the terminal bromine atoms of -0.13 and -0.17 a.u., respectively. The Br(-).Br3(+) structure is also consistent with the fact halogen trihalides have a less electronegative central atom. It seems that Br4 might be detectable by microwave spectroscopy if the apparatus could withstand the corrosive power of Br2. I have just done a search of the CSD. 155 hits are obtained for the anion Br3(-), but none for the cation Br3(+). So on this basis alone, there is little evidence for Br3(+), or for that matter Br(+) on its own. Re Peter’s suggestion of I4, and mindful that with this element, relativistic effects might be important, here is the calculated IRC (B3LYP/6-311++G(2d,2p), with a free energy barrier of ~13 kcal/mol. This is rather less than with Br4. Certainly worth checking what effect relativistic corrections would have on this value. Re relativistic corrections for eg I4. Calculating the energies (no geometry re-optimisations) with inclusion of the Douglas-Kroll-Hess 2nd order scalar relativistic correction to the two-electron integrals gives an activation energy of 15.8 kcal/mol (not free energy). Although a crude estimate of the effect of relativistic corrections, this result does suggest that they are not going to be massive! The basis set used for iodine was an all electron basis, as appropriate for making such a correction. Allotropic halogens. is licensed by Henry Rzepa under a Creative Commons Attribution-Noncommercial-Share Alike 3.0 United States License.